- Why does this library book have my name in it? - Is it overdue? If it is, how much do I owe? - Did I somehow travel back in time to the late 1980s? Just wondering, because that was the last time I saw a library check-out card. Available at One Good Bumblebee. File this under "A powerful community response saves the day." They didn't give Tyler Stewart the shirts off their backs, but fans of Central Square's Pandemonium Books did buy shirts to get Uncle Sam off Stewart's back. Even other local bookstores came to his aid. When Stewart, owner of the science fiction bookstore, learned he owed the IRS $15,000 in back taxes, he thought he might have to close his business, which had moved to Central from Harvard Square just last June. Then, he came up with a plan. If he sold 1,000 T-shirts at $20, making a $15 profit apiece, he could dig out. "We did it," he said. "We sold over 1,000 shirts in two weeks. I'm completely grateful for the response." I purchase books online all the time. It's convenient, and online stores posses a diverse selection I can't find in brick-and-mortar stores. I'll continue to shop online, too. But I believe independent bookstores are good for a community. They're often a gathering place, even without cafes attached to them. They are symbols of thinking and learning, and the independent ones are often more open to local writers and artists showcasing their works there than the big-box stores usually are. I can't count how many bookstores I've visited throughout my life. Often when visiting a new place, I'll scope out the local bookstores to get a sense of the creative scene. I love checking out eclectic picks by the stores' employees, reading the community bulletin board packed with flyers, people-watching. What's that old saying again? I remember it now: "Whenever an independent bookstore goes out of business, a book angel somewhere weeps." How's your local independent bookstore doing these days? How does this store contribute to your community? Even if you buy books online, what does your local independent bookstore give you that the Web-mall or a big-box store cannot? If all independent bookstores close, what will we lose? On PSFK, I've posted today about a home decor and carpet store transforming part of its showroom into a spa and theater to feature Indian culture for a month. The store will present an incredibly impressive speaker series with many big names. Writers, visionaries, musicians, filmmakers, and artisans are all heavily featured. A store is doing this? Is this is a sign of things to come? It really caught my attention because it is so unusual. The store features items from India, and they are not its primary inventory. It is a local store with a few others around the country, and it has flexibility to tap into an interested market and try to educate and enlighten. Now if only some big store would feature a regular writers series, featuring published and unpublished authors...I love it when the small cafes do it, but I believe that artists and writers are cultural treasures and should be treated as such. The larger community should promote and support them regularly. - Decorate your computer monitor. - Hang from your review mirror, your bicycle handle bars, or your backpack. - Tape it to a wrapped book as part of the gift. - After tweaking a bit, transform them into a funky earring and necklace set. However you use them, your purchase supports world literacy. Read more about them here. Found at The Literacy Site. Now, THIS is a book bag. 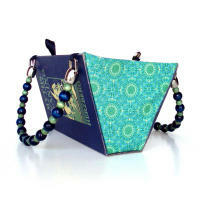 Rebound Designs has created some of the most original purses I've ever seen. To me, they represent the ultimate blend of the literary and fashion worlds. Aw, who am I kidding? They're just cool and different. Eye catching. Unique. I'm quite sure I want one. 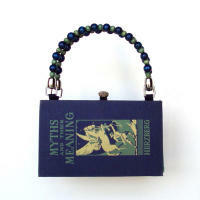 Pictured above is the Myths and Their Meanings pocketbook (ahem). We were at a mall today. We were at this same mall two days ago. We visit this mall perhaps twice a year, when we either need something immediately or when my favorite store — "The Internet" — doesn't have it. We are already way over quota for mall visits this year. Two days ago, when we walked past the store/nightclub known as Abercrombie & Fitch, backbeat blaring, reaching way beyond the store walls and tearing into eardrums for miles around, I pumped my fist in the air. I did it without thinking. I couldn't resist. "Wouldn't it be great to set up a hidden camera across from the A&F to see how many people break out a little move as they walk by?" I asked my husband. He laughed, nodding yes, as we pushed our stroller as quickly away as we possibly could. Today we were really desperate. We needed something immediately. We had shopped and shopped and had not found anything. Our next brainstorm: Abercrombie & Fitch. Yes, we had come to this. And having reached this open-to-anything level, we scoured every store we walked past. So before reaching the bold, blaring A&F, we found another one directly across from it. In smaller, lower-case letters above its door read, "abercrombie." When I'm shopping and can't find anything, I get very emotional. A cloudy haze of fashion fears and anxieties descend and blanket me in confusion. I literally can't see anything: fabrics, colors, which are pants and which are shirts. So I asked my husband if he could go in first to scope out the store. He descended behind the velvet rope and doorman and emerged a few moments later. "It's for kids," he said. "Kids?" I replied, shocked. "That stuff is for kids?" My ears pounded from standing just outside the store. "Who could let their kids go into that place? It's so loud it could damage anyone's hearing. No responsible parent would let their kids into that place." Here is where my stress peaked. But A&F had already considered my parental concerns. As we walked across the mall's span to the big A&F, it became entirely clear which store was for little kids and which was for the club kids. The decibel level in the kids' abercrombie, though still semi-deafening, resembled a zen monastery at sunrise mediation in comparison to the full-frontal flagship A&F, which, seeming to sense our hopelessness, beckoned us to enter its pulsating walls.